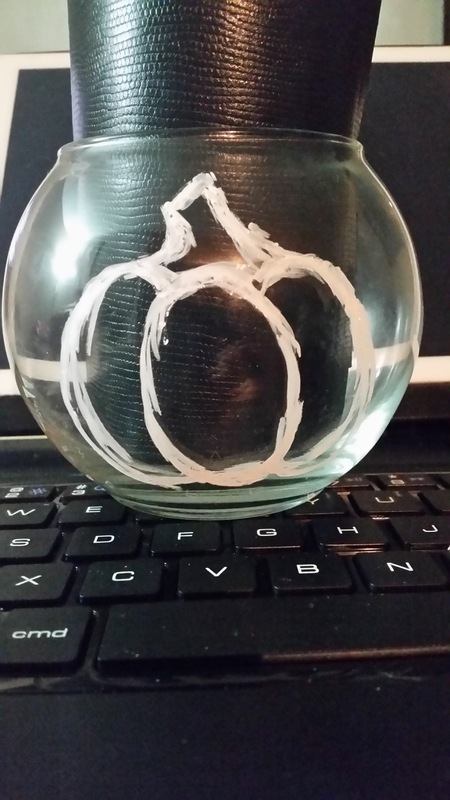 You don’t have to do a pumpkin like me but I had this random thought in my head. I acted on it. So I just picked this up from the Dollar Tree. It’s not all that big but it’s perfect for this project. 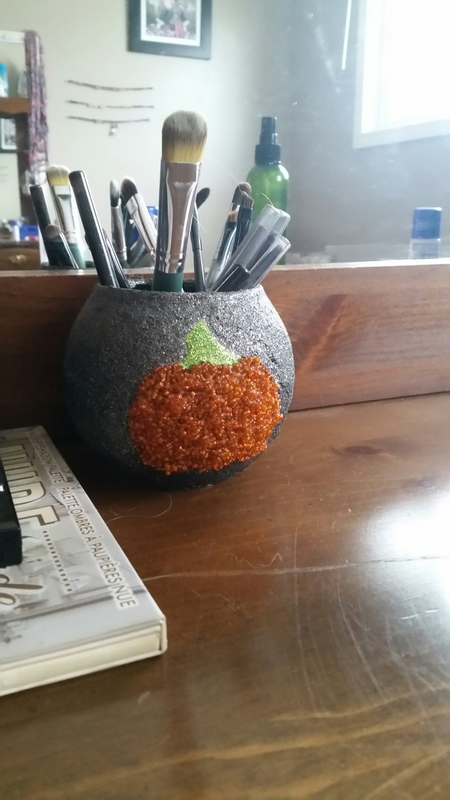 This is the first pumpkin I had drawn on (with Craft Decor chalk writer boughten from the Dollar Tree). It’s rough looking as I was rubbing away excess off the surface. I want to note this like a mix of chalk and oil pastel. I personally won’t use it on a chalk board but works with glass projects. 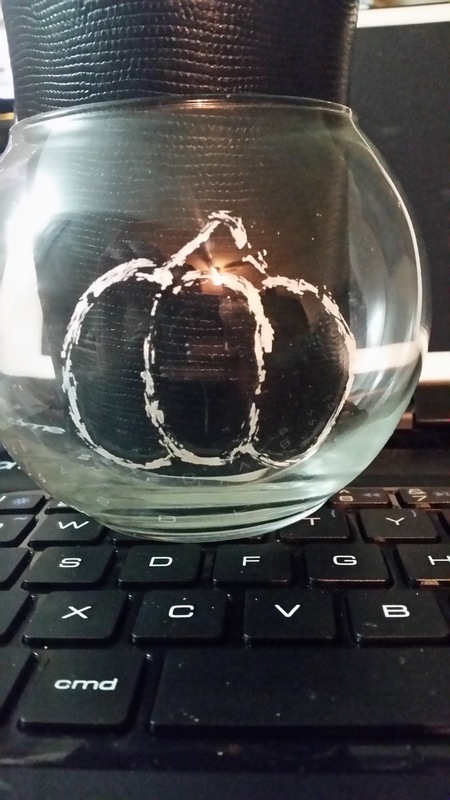 This is the second pumpkin I drew. It is much bigger than the first and I think it works much better. I’ll be making the outside lines smaller and getting rid of the inside ones. I wanted to start with the beads first. 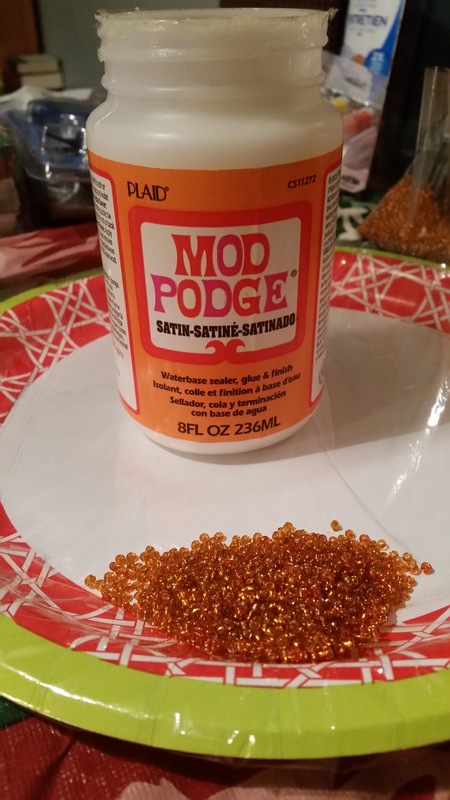 I mixed them directly with the Mod Podge. I proceed to fill in the pumpkin. This isn’t very fun and if some one has a better/easier idea please let me know. I would have preferred the beads to be flat but I don’t mind it this way. Gives it a bit of depth. 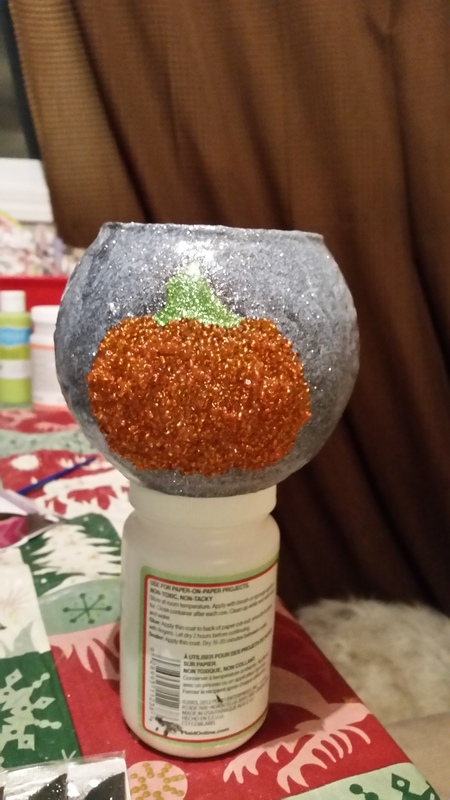 I then took the Mod Podge mixed with a fine green glitter to create the cut off stem. 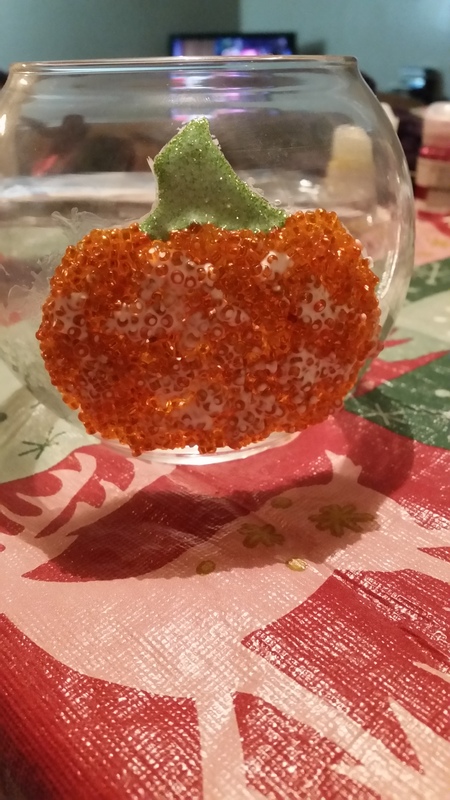 I made it quite thick that way it would pop out like the pumpkin. After the edges dried some I then took a few different shades of black glitter (one had quit a bit of a silver look to it. Oops!) mixed with Mod Podge. I was fairly lazy and did not want to do more then one layer. So this was done in one fairly thick layer. 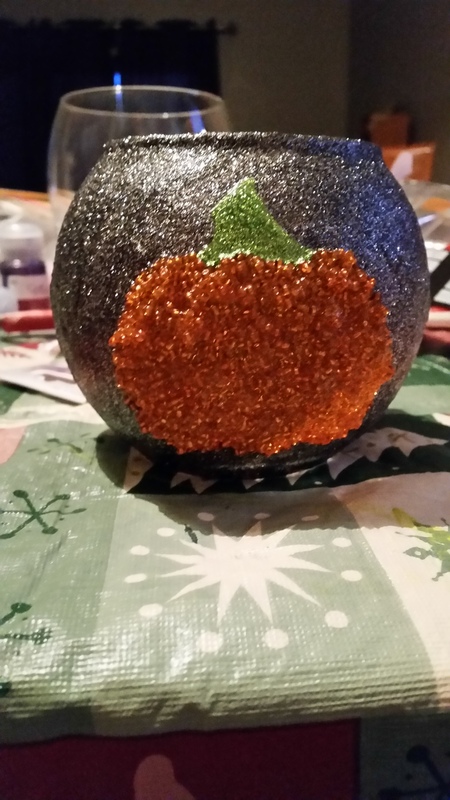 The glitter to glue ratio was higher than when I did the stem. The down fall of doing a thick layer is that it is much harder to work with and it takes quite a long time to dry. I left it for nearly four days just to make sure it was safe to use. You can see here that the black is very silver. I wanted something more of a prominent black but I am happy with the way it turned out. 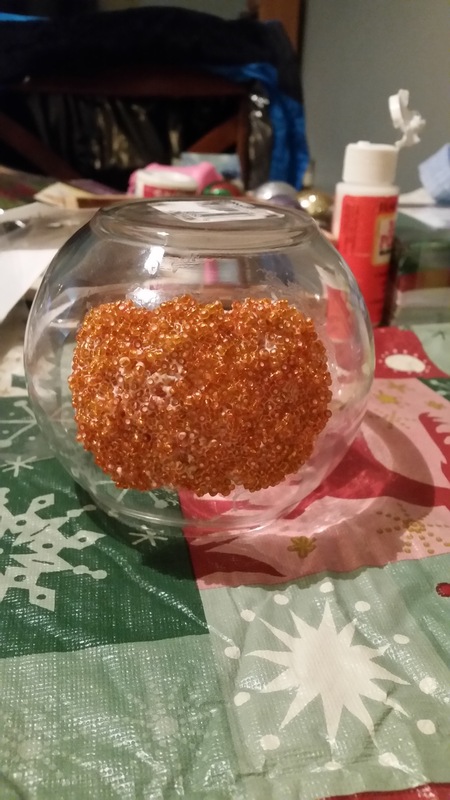 This was taken after the top layer of glue dried and I could move it to somewhere safe to dry the rest of the way through. 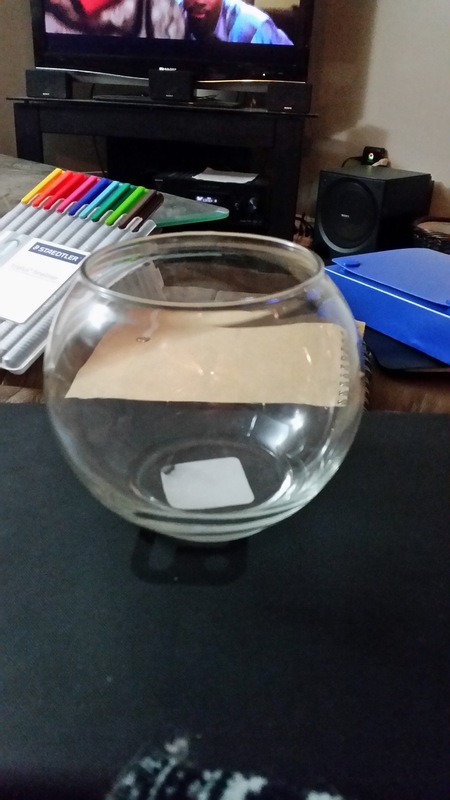 I did not originally have a plan on how I wanted to use the vase, I just new I wanted to make it. I bought a bag of black sand from the Dollar Tree and have been using it as a make-up brush holder (my eyeliner is in there too). I really love this piece! When I last made an update on where I was to being debt free meeting my goal for this year. I had said that I was going to do another progress report before the end of the year hit. I make a payment to one of my debts twice a month but I am still excited to see that amount go down after every payment. The debt I am focusing on jumped around the first 5 months of the year. I how however am not going to get into what kind of debt it is though. It is was just under $6,000.00. I wanted to have my debt paid down by one third come the end of December. If I break this out separate I will have paid this down to a quarter of the debt left owing. Currently I am just over half way paid off! The revolving debt I have not really made much a dent in. I do not feel defeated though. I knew that when I made up the payment plan in June that I had a ways to go. I do not gamble (with my own money but that’s a post for another time), so how could I magically pay everything off in a year? I would love to say by the end of 2017 I will have everything paid off but I am re-thinking how I will precede with that year. I have a method to my madness and I will write a post on what worked for me personally. I just need to make sure that it works for me since I am still on the first debt. There could be half a dozen tweaks I still need to make before things settle on the right path. Saturday October 1, 2016 was our first snowfall of the year and it was record breaking. 23 cm of SNOW!!! To say the least I do not think anyone else was ready for what we got. However miss Galaxy is in heaven again and I did take a video. She is just so happy during this time of year that I cannot help myself. The video jumps as Galaxy was boring for a bit.